The tin roof and a burned-out frame are all that remains of the little old place where singer Kate Pierson once got together with her bandmates from the B-52's. A fire gutted the unoccupied five-room cabin set back in a field that some believe inspired the B-52's party hit "Love Shack." Fire officials are investigating the possibility of arson. Other properties near Athens — where the quirky band known for towering beehive wigs and catchy, oddball pop songs formed in 1976 — have also been credited with being the original "Love Shack." 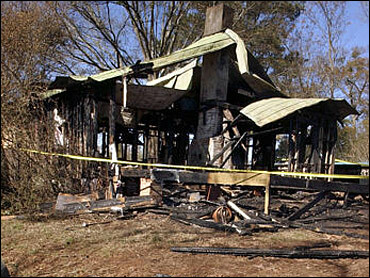 But it's known that Pierson lived in the fire-ravaged house in the 1970s. The book "The B-52's' Universe," published in 2002, includes photographs of the group outside both the wood-framed cabin and the nearby outhouse located on 80 acres in northern Clarke County. "I just was in touch with the B-52's," said Allisa Huestis of Atlanta, who planned to move into the renovated house next week. "They said it was the original Love Shack and was where they created 'Rock Lobster,"' the popular song from the band's 1979 debut album. That album, simply called The B-52's, marked the first step in establishing Athens as an alternative music mecca — a reputation cemented in the 1980s by the group R.E.M. Athens-Clarke County fire officials said Thursday they still considered the Monday morning fire "suspicious" and had not ruled out arson. Fire Inspector Reginald Hunter said the 4:30 a.m. fire could not have been caused by faulty electrical wiring or a gas leak because the unoccupied cabin was not hooked up for utilities. He said building supplies used for renovating the house had been stolen. "A lot of times when people commit arson they do it to cover something up," Hunter said. Released in 1989, "Love Shack" became the B-52's first Top 10 hit, rising to No. 3 on the Top 40 charts. "The Love Shack is a little old place where we can get together," Pierson and bandmate Cindy Wilson sing in the refrain. The lyric describes the Love Shack as "set way back in the middle of a field/Just a funky old shack." And there's the feature Wilson describes after the final chorus: "Tin roof. Rusted!" Mats Sexton, author of "The B-52's Universe," said Pierson talked to him of her former house. In the 1991 book "Party Out of Bounds: The B-52's, R.E.M. and the Kids Who Rocked Athens, Georgia," Rodger Lyle Brown wrote that Pierson and her husband rented the house on a dairy farm for $15 a month after moving to Athens in 1973. "It's really sad that it burned down, and I hope it wasn't because of mischief," said Karen Middendorf, who lives on the adjoining property. "Athens has such a strong music history it would have been nice to keep it standing."